A popular theory holds that life emerged from a rich chemical soup in which RNA was the original self-replicator. But a combination of peptides and RNA might have been more effective. Four billion years ago, the first molecular precursors to life emerged, swirling about in Earth’s primordial soup of chemicals. Although the identity of these molecules remains a subject of fractious debate, scientists agree that the molecules would have had to perform two major functions: storing information and catalyzing chemical reactions. The modern cell assigns these responsibilities to its DNA and its proteins, respectively — but according to the narrative that dominates origin-of-life research and biology-textbook descriptions today, RNA was the first to play that role, paving the way for DNA and proteins to take over later. This hypothesis, proposed in the 1960s and dubbed the “RNA world” two decades later, is usually viewed as the most likely explanation for how life got its start. Alternative “worlds” abound, but they’re often seen as fallback theories, flights of fancy or whimsical thought experiments. That’s mainly because, theorizing aside, the RNA world is fortified by much more experimental evidence than any of its competitors have accumulated. Last month, Quanta Magazine reported on an alternative theory suggesting that protein-like molecules, rather than RNA, may have been the planet’s first self-replicators. But its findings were purely computational; the researchers have only just begun experiments to seek support for their claims. Now, a pair of researchers has put forth another theory — this time involving the coevolution of RNA and peptides — that they hope will shake the RNA world’s hold. Recent papers published in Biosystems and Molecular Biology and Evolution delineated why the RNA world hypothesis does not provide a sufficient foundation for the evolutionary events that followed. Instead, said Charles Carter, a structural biologist at the University of North Carolina, Chapel Hill, who co-authored the papers, the model represents “an expedient proposal.” “There’s no way that a single polymer could carry out all of the necessary processes we now characterize as part of life,” he added. And that single polymer certainly couldn’t be RNA, according to his team’s studies. The main objection to the molecule concerns catalysis: Some research has shown that for life to take hold, the mystery polymer would have had to coordinate the rates of chemical reactions that could differ in speed by as much as 20 orders of magnitude. Even if RNA could somehow do this in the prebiotic world, its capabilities as a catalyst would have been adapted to the searing temperatures — around 100 degrees Celsius — that abounded on early Earth. Once the planet started to cool, Carter claims, RNA wouldn’t have been able to evolve and keep up the work of synchronization. Before long, the symphony of chemical reactions would have fallen into disarray. “A system that uses information the way organisms use genetic information — to synthesize their own components — must contain reflexive information,” Wills said. He defined reflexive information as information that, “when decoded by the system, makes the components that perform exactly that particular decoding.” The RNA of the RNA world hypothesis, he added, is just chemistry because it has no means of controlling its chemistry. “The RNA world doesn’t tell you anything about genetics,” he said. Nature had to find a different route, a better shortcut to the genetic code. Carter and Wills think they’ve uncovered that shortcut. It depends on a tight feedback loop — one that would not have developed from RNA alone but instead from a peptide-RNA complex. This implied an elementary kind of coding, a basis for the exchange of information between the RNA and the polypeptide. He was on his way to sketching what that might have looked like, working backward from the far more sophisticated modern genetic code. When the RNA world, coined in 1986, rose to prominence, Carter admitted, “I was pretty ticked off.” He felt that his peptide-RNA world, proposed a decade earlier, had been totally ignored. Since then, he, Wills and others have collaborated on a theory that circles back to that research. Their main goal was to figure out the very simple genetic code that preceded today’s more specific and complicated one. And so they turned not just to computation but also to genetics. At the center of their theory are 20 “loading” molecules called aminoacyl-tRNA synthetases. These catalytic enzymes allow RNA to bond with specific amino acids in keeping with the rules of the genetic code. “In a sense, the genetic code is ‘written’ in the specificity of the active sites” of those enzymes, said Jannie Hofmeyr, a biochemist at Stellenbosch University in South Africa, who was not involved in the study. Previous research showed that the 20 enzymes could be divided evenly into two groups of 10 based on their structure and sequence. These two enzyme classes, it turned out, have certain sequences that code for mutually exclusive amino acids — meaning that the enzymes had to have arisen from complementary strands of the same ancient gene. 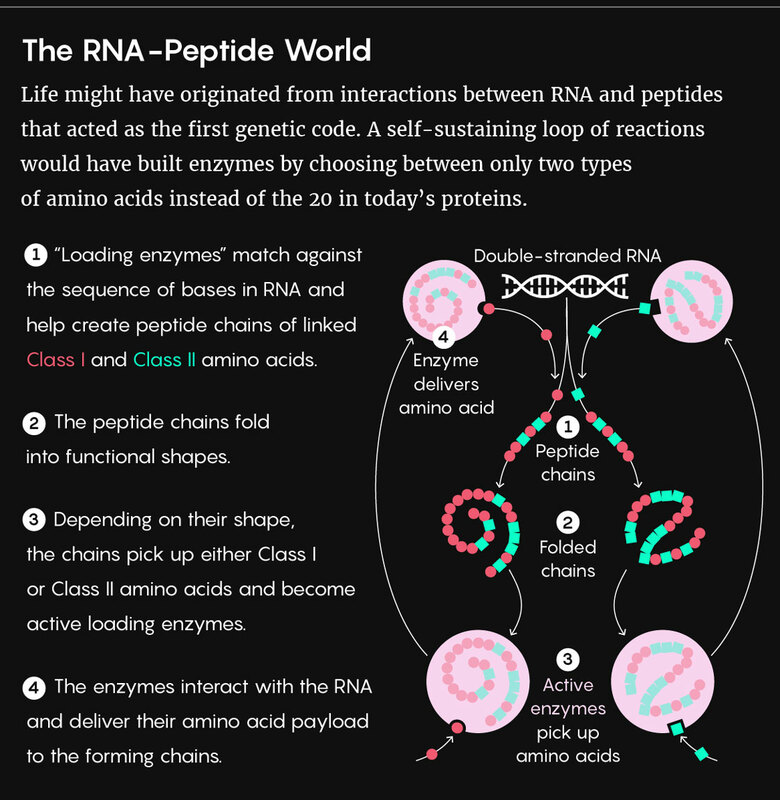 Carter, Wills and their colleagues found that in this scenario, RNA coded for peptides using a set of just two rules (or, in other words, using just two types of amino acids). The resulting peptide products ended up enforcing the very rules that governed the translation process, thus forming the tight feedback loop the researchers knew would be the linchpin of the theory. Carter sees strong parallels between this kind of loop and the mathematical one described by the philosopher and mathematician Kurt Gödel, whose “incompleteness” theorem states that in any logical system that can represent itself, statements will inevitably arise that cannot be shown to be true or false within that system. “I believe that the analogy to Gödel’s theorem furnishes a quite strong argument for inevitability,” Carter said. Of course, the Carter-Wills model begins with the genetic code, the existence of which presupposes complex chemical reactions involving molecules like transfer RNA and the loading enzymes. The researchers claim that the events leading up to their proposed scenario involved RNA and peptides interacting (in the complex that Carter described in the 1970s, for example). Yet that suggestion still leaves many open questions about how that chemistry began and what it looked like. To answer these questions, theories abound that move far beyond the RNA world. In fact, some scientists take an approach precisely opposite to that of Carter and Wills: They think instead that the earliest stages of life did not need to begin with anything resembling the kind of chemistry seen today. Doron Lancet, a genomics researcher at the Weizmann Institute of Science in Israel, posits an alternative theory that rests on assemblies of lipids that catalyze the entrance and exit of various molecules. Information is carried not by genetic sequences, but rather by the lipid composition of such assemblies. Just like the model proposed by Carter and Wills, Lancet’s ideas involve not one type of molecule but a huge variety of them. “More and more bits of evidence are accumulating,” Lancet said, “that can make an alternative hypothesis be right.” The jury is still out on what actually transpired at life’s origins, but the tide seems to be turning away from a story dedicated solely to RNA. “We should put only a few of our eggs in the RNA world basket,” Hofmeyr said. It is about time that RNA nonsense comes to an end. There is admittedly considerable scientific knowledge that has and can still be gained by studying RNA macromolecules, but the desperation of naturalists proposing it either as the source of first life is intellectually insulting. RNA’s complexity may be assemblable in intelligent design highly managed labs environments, but ridiculous to consider possible in any geochemically relevant primordial environment. RNA is easily mutated, highly reactive, and only an intermediate macromolecule restricted by the protein catch-22. Frustratingly, the desperation continues with propositions of lipid collective assembly, but at least science appears to coming to its senses about RNA.